One of the best things about summer is the wide variety of just picked fruits and veggies that are readily available. But one of the not so wonderful things about summer would be having to be heating up the kitchen on a day when it feels as if the sun could do the cooking for me! On steamy summer days such as this, one of my favorite meals is some tasty meat thrown on the grill (chicken, steak or burgers) paired with a refreshing side dish that makes great use of the amazing produce growing in my yard or from the local market but does not make much use of my oven. This tasty mix of fresh, crispy cucumber, salt, pepper and mayonnaise fits that bill and then some. The only work to do is chop and stir and then let the refrigerator do the rest. So the next time you want a side that requires almost no effort and no kitchen heat but tastes amazing give this cucumber salad a try. All you will need to do is gather some people, fire up the grill, chill the cucumbers and drinks and let summer work it's magic on you and yours! 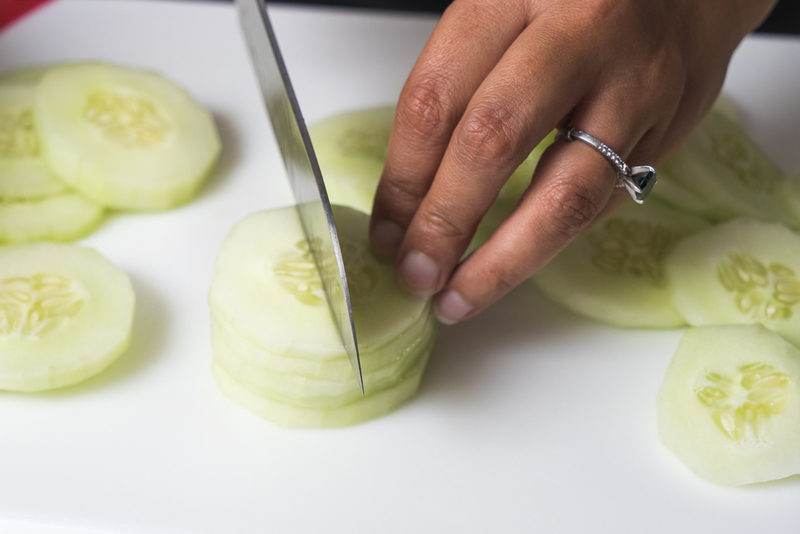 Peel cucumber skin and chop into medium circles. Place cucumber pieces into a bowl and add the mayonnaise. Mix well and add salt and pepper. Taste and add more salt and pepper until taste is to your liking. Chill in the refrigerator for at least 15 minutes and enjoy!